64 Billion Messages in 24 hours – That is surely a huge number. Just to put it in perspective that means around 45 million messages (sent and received) in a minute. Here is something for you to ponder. Although, I do not have confirmed numbers, traditional mobile SMSes are way less in numbers and they are falling further, in part due to growth of mobile instant messengers like Whatsapp. In US, roughly around 6 billion traditional SMSes are sent (2011-12). If you compare that, Whatsapp already does 10 times of that number. The announcement was made by WhatsApp on their Twitter account, where they announced the record. 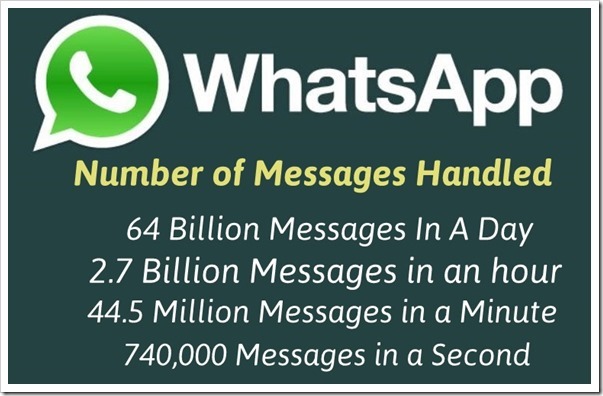 Out of total 64 billion messages, 20 billion were sent and 44 billion were received by WhatsApp users. The reason received messages are nearly double that of sent – Group messaging is extremely popular on WhatsApp, and while one message is sent, multiple users receive it and hence such high incoming messages. When Facebook had taken over WhatsApp, many users were saying that WhatsApp will fade away citing privacy issues. This record of 64 billion messages clearly shows that everything is going well at WhatsApp headquarters as well as their users. Telecom operators across the world have now understood that traditional SMSes are dying, if not dead already. It is good to see that operators are now accepting this fact, an actually forging partnerships with them to jack up their mobile data usage. Currently, SMS are being primarily used by institutions like Banks to send alerts to their users. But in future, it is quite possible that too may get replaced by WhatsApp and others. Gionee’s Elife S5.5 Launch Event; That’s How Product Launches Should Be! JioPhone Has Google Maps Now – Reliance Jio Wants To Defeat Android In India? Will Your Phone Support Whatsapp From Now On? Checkout This List Right Now! GPS Mandatory For Feature Phones; Facebook Is Jio Phone’s First 3rd Party App!